President Trump, with Vice President Pence, poses with a plaque given to him by sheriffs from across the country during a meeting in September. Trump has campaigned as a strong advocate for law enforcement. 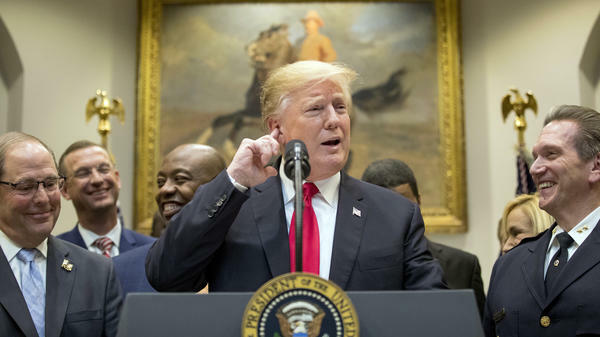 President Trump speaks from the White House on Nov. 14 as he announced his support for the first major rewrite of the nation's criminal justice sentencing laws in a generation. The Senate passed a bill on Tuesday that would reduce federal sentences for certain drug offenses and prepare prisoners for life after incarceration. If the bill becomes law following passage in the House on Wednesday, a major reason will be the support it received from a surprising booster: President Trump. Trump has made being "tough on crime" one of his calling cards. 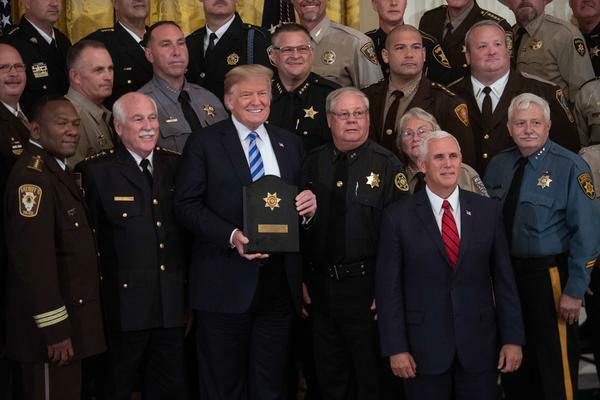 But, after months of a mostly behind-the-scenes campaign from some of his closest advisers, Trump threw his backing behind legislation that would roll back some of the stiff penalties enacted in response to the so-called "war on drugs." Trump's endorsement of the Senate's First Step Act stands in stark contrast to some of the rhetoric he has employed while in office and marks a break with some of the policies enacted by his own Justice Department. Among other things, the legislation would promote prison rehabilitation programs and end automatic life sentences under the three-strike penalty for certain felonies. The president's first attorney general, Jeff Sessions, was a staunch opponent of any changes reducing federal sentencing for crimes. Sessions rescinded Obama administration guidance that sought to shorten sentences for non-violent drug offenders. Instead, Sessions directed prosecutors to seek the toughest punishments allowed under the law. With the U.S. facing a drug overdose epidemic, Trump, too, at times has argued that drug dealers are not punished enough. He has even talked about wanting to utilize the death penalty against drug traffickers. "We are really going after the traffickers; I have always said that's the biggest thing," Trump said in August. "And, frankly, the punishment is getting stronger and stronger. Maybe, at some point, we'll get very smart as a nation and give them the ultimate punishment." So, how did Trump wind up coming out in favor of a bill aimed at giving a second chance to people who commit crime? A major influence on his decision was his son-in-law and White House adviser Jared Kushner. "This bill would have been dead on arrival without Jared Kushner," said David Safavian, who works for the American Conservative Union Foundation, which supports this new Senate legislation. "He's been able to make the case to the president as to why this is good for neighborhoods, good for the economy, good for individuals and good for families," Safavian said. Kushner, whose father served time in federal prison, has led the charge in the White House to make changes to the U.S. criminal justice system. He found allies for this cause in conservative groups like Safavian's and among some of Trump's powerful evangelical supporters. These groups and their progressive counterparts argue that unreasonably long sentences have clogged up U.S. prisons, costing taxpayer dollars without lowering crime rates. At White House round table meetings, advocates like Shon Hopwood told Trump that there were better ways to crack down on crime. Hopwood met with Trump earlier this year. "What I told the president was... I committed a violent crime but I am not a violent criminal and that people can change," Hopwood said. "And the law should recognize that." Hopwood is now a law professor at Georgetown University, but he spent nearly 11 years in prison for bank robbery. He says he thinks hearing stories like his made Trump look at prisoners differently. The push to persuade Trump seems to have paid off. After supporting a more limited bill in the House, last month Trump came out in favor of the more expansive Senate bill. It also likely helped that Sessions was pushed out as attorney general in November. Without Trump's endorsement, the bill almost certainly wouldn't have come up for a vote. Safavian says unlike other politicians, Trump benefits from not having to worry about opponents painting him as "weak" on crime. He describes the logic this way: "You know Donald Trump is tough on crime. Donald Trump endorses this bill — therefore this bill is not soft on crime." "Donald Trump advancing conservative criminal justice reform is analogous to Nixon going to China — only a Republican who's tough on crime could achieve the success that we are on the verge of reaching," Safavian added. Even with Trump's support, the bill has faced intense criticism from Republicans like Senator Tom Cotton of Arkansas. Cotton argues the bill "goes soft on some of the worst crimes" and that it will allow violent criminals out of prison early. Backers of the bill dispute Cotton's arguments. They say it only allows for limited and strictly supervised release and that it only applies to prisoners who are not considered high risk. But, even some of those that support the legislation, say that Trump's harsh language about crime and some of the actions by his administration are at odds with the bill's goals. "This administration has a very mixed record on criminal justice reform," said Inimai Chettiar, of the Brennan Center for Justice, which has come out in favor of the First Step Act in the Senate. Chettiar pointed to Sessions' reversal of the Obama era sentencing provisions as a harmful development under President Trump. "They have been using extremely dangerous rhetoric around crime, particularly as it relates to immigration ... and also using a lot of 'war on drugs' rhetoric that not only is dangerous, but also those policies are just ineffective," she said. Some on the left argue the Senate bill doesn't go far enough, though. They say it excludes a lot of people already in prison serving long sentences, who they believe should be offered some relief. Breon Wells, a political strategist who advises activists on ending mass incarceration, says he's worried that Trump's mixed messages on crime may lead the Justice Department to not fully implement the law. "Do we have good faith, long term, committed partners in this so that this first step doesn't become something where everyone pats themselves on the back... and then we don't revisit this for another five, 10 or even 20 years?" Wells said. Today the Senate considers a bill to reduce federal sentences for some drug offenses. It is also meant to prepare inmates for life after prison. Supporters say this bill would not have made it this far without a surprising supporter - President Trump. Here's NPR's Ayesha Rascoe. PRESIDENT DONALD TRUMP: My administration is determined - totally determined to restore law and order. RASCOE: ...To those decades when the war on drugs and high crime rates led to stiff punishments for drug offenses. TRUMP: We need law and order in our country. RASCOE: And it's not just talk. Trump's first attorney general, Jeff Sessions, directed prosecutors to seek tougher penalties for some nonviolent drug offenses. So how did Trump end up pushing a bill that would reverse some of those tough-on-crime laws? One factor - his son-in-law. DAVID SAFAVIAN: This bill would've been dead on arrival without Jared Kushner. RASCOE: David Safavian works for the American Conservative Union Foundation, which supports this new Senate legislation. His group found an ally in Kushner who's a top White House adviser. Groups like Safavian's and their progressive counterparts argue that unreasonably long sentences have clogged up U.S. prisons, costing taxpayer dollars without lowering crime rates. Kushner, whose father served time in federal prison, has led the charge in the White House to make changes to the nation's criminal justice system. SAFAVIAN: He's been able to make the case to the president as to why this is good for neighborhoods, good for the economy, good for individuals and good for families. RASCOE: At White House roundtable meetings, advocates like Shon Hopwood told Trump that there were better ways to crack down on crime. Hopwood met with Trump earlier this year. SHON HOPWOOD: Well, what I told the president was - I said, you know, I committed a violent crime, but I am not a violent criminal and that people can change and the law should recognize that. RASCOE: Hopwood is now a law professor at Georgetown University, but he spent nearly 11 years in prison for bank robbery. He says he thinks hearing stories like his made Trump look at prisoners differently. The push to persuade Trump seems to have paid off. After supporting a more limited bill in the House, last month Trump came out in favor of the more expansive Senate bill. It would promote prison rehabilitation programs and end automatic life sentences under the three-strike penalty for certain felonies. TRUMP: We all benefit when those who have served their time can find a job, support their families and stay the hell out of jail, right? That's what we want. Stay out of jail. RASCOE: Without his endorsement, the bill likely wouldn't have come up for a vote. Safavian says unlike other politicians, Trump doesn't have to worry about opponents painting him as weak on crime. SAFAVIAN: You know, Donald Trump is tough on crime. Donald Trump endorses this bill. Therefore, this bill is not soft on crime. RASCOE: Still, some Republican critics argue it will free violent criminals, and some on the left argue it doesn't go far enough. Breon Wells, a political strategist who has worked on these issues, says he's worried that Trump's mixed messages on crime may lead the Justice Department to not fully implement the law. BREON WELLS: Do we have good faith, long-term committed partners in this so that this first step doesn't become something where everyone pats themselves on the back and then we don't revisit this for another five, 10 or even 20 years? RASCOE: If the bill does pass, the 180,000 inmates in federal prison will soon learn what Trump's new version of law and order means for them. Ayesha Rascoe, NPR News, Washington. (SOUNDBITE OF SCRIMSHIRE'S "FUSELAGE") Transcript provided by NPR, Copyright NPR.